We want to improve surgery planning by providing a simulation system that is able to accurately predict patient-specific results for different surgical procedures preoperatively. Therefore we use a sophisticated simulation model based on thin shell elements and developed a novel mesh joining approach that allows for implementing all necessary surgical low-level procedures, e.g. incising and suturing, independent from the simulation model. In laparoscopic radical prostatectomy (LRP) an accurate preparation near the organ may spare the patient’s pelvic innervation and consequently preserve urinal continence and sexual potency. 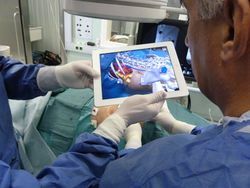 To support the dissection of the prostate an Augmented Reality (AR) Navigation System which conveys virtual organ models generated from transrectal ultrasonography (TRUS) onto the real endoscopic video during radical prostatectomy was created using MITK. The system utilizes custom-developed needles with colored heads which are inserted into the prostate as soon as the organ surface is uncovered. A 3D TRUS scan is acquired right after the placement of the needles and processed using MITK segmentation framework to delineate the important structures (nerve bundles, urethra, etc.). 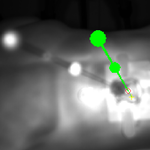 Furthermore, the heads of the needles are located in the 3D ultrasound using the interactive point setting tools in MITK. Thereafter, the system traces the navigation aids in real-time and correctly superimposes the TRUS-based 3D information on an additional AR monitor placed next to the normal endoscopic screen. As a result, the surgeon is provided with valuable information of hidden structures and enables a safe and efficient resection of the prostate. The MITK Diffusion application offers a selection of image analysis algorithms for the processing of diffusion-weighted MR images. 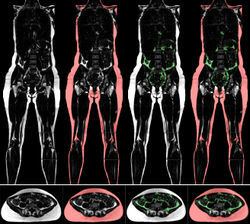 It encompasses the research of the Division Medical Image Computing at the German Cancer Research Center (DKFZ). Percutaneous needle insertions are widely applied in clinical routine e.g. to perform biopsies or radiofrequency ablations (RFA). In these intervention, a needle-shaped instrument is inserted through the skin into the target organ. 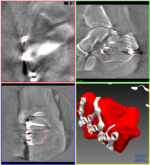 The main challenges include the trajectory planning which is conventionally performed on the 2D slices of the computed tomography (CT) volume, the transfer of the planned trajectory to the actual situation at the patient (registration), the consideration of movements and deformation e.g. through respiration (motion compensation) and an appropriate visualization during the targeting procedure. 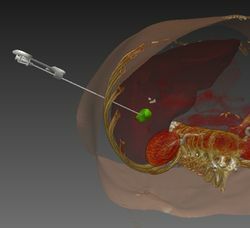 Several projects have been realized with the use of MITK that aim at providing methods for computer-assisted needle insertion. These will be described in the following. Related publication: Rassweiler JJ, Müller M, Fangerau M, Klein J, Goezen AS, Pereira P, Meinzer HP, Teber D. iPad-Assisted Percutaneous Access to the Kidney Using Marker-Based Navigation: Initial Clinical Experience. European Urology, 2012. 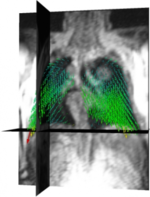 The segmentation of tubular structures from 3D medical image data is the essential basis for many computer-assisted applications such as operation planning and the development of an individualized ventilation strategy. Our project has as its objective the development of a robust segmentation procedure to achieve precise results with few user interactions in a clinically feasible amount of time. 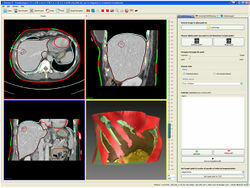 Geometric alignment of 3D models is a common task in the context of medical image processing. Given two roughly aligned surfaces, e.g. 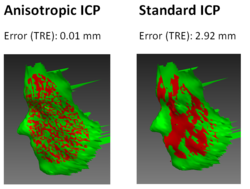 CT data segmentations and intraoperative range data, a registration algorithm must establish point correspondences and compute a transformation. The Iterative Closest Point (ICP) algorithm is frequently applied in this context. However, from a statistical point of view, this algorithm implicitly assumes that the distribution of the noise in the acquired point data is isotropic. In practice, point localization errors may be highly anisotropic in range data acquired by e.g. a Time of Flight device. In this project, the ﬁrst variant of the ICP which accounts for anisotropic localization uncertainty was presented and implemented in MITK. Bronchoscopic interventions, such as transbronchial needle aspiration (TBNA), are commonly performed procedures to diagnose and stage lung cancer. However, due to the complex structure of the lung, one of the main challenges is to find the exact position to perform a biopsy and to actually hit the biopsy target. To overcome this problem an image-guided, electromagnetic navigation system for transbronchial interventions was developed. Utilizing MTIK and MITK-IGT, the system provides real time positioning information for the bronchoscope and a transbronchial biopsy instrument with only one preoperatively acquired computed tomography image. A twofold respiratory motion compensation method based on a particle filtering approach further allows for guidance through the entire respiratory cycle. Related publication: Gergel I, Gaa J, Müller M, Meinzer HP, Wegner I. 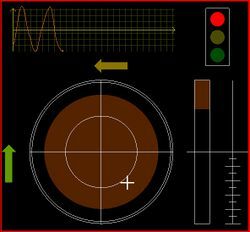 A novel fully automatic system for the evaluation of electromagnetic tracker. In: Medical Imaging 2012: Image-Guided Procedures, Robotic Interventions, and Modeling / David R. Holmes III, Kenneth H. Wong, SPIE Bellingham, Washington, 2012. In the course of numerous lung diseases, and following therapy, a reduction in respiratory motion and thus restricted pulmonary function is observed. New imaging techniques have recently provided non-invasive methods for depicting these changes. 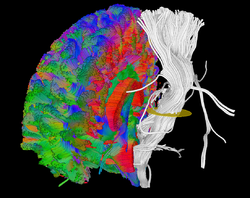 The aim of the project is to establish the technical basis for analyzing respiratory motion using 3D+t magnetic resonance imaging or computed tomography. To this end, one of the approaches currently being followed is to define vector fields that approximately reflect the motion of lung parenchyma during the respiratory cycle. The analysis of the vector fields permits conclusions about the movement, within a local area, and deformation of tissue. When coded onto a color map, this information may be used, for instance, to track how successful a therapy is over time. Although non-rigid registration methods are available or under development for many specific problems in medicine, rigid and affine registration is an important task that is often performed for pre-aligning images before using non-rigid registration. We present a free and open-source application for rigid and affine image registration, which is designed both for developers and for end-users. 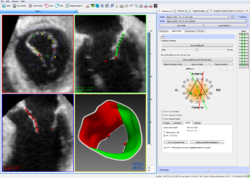 The application is based on the MITK and allows for inter-modality and intra-modality rigid 2D-2D and 3D-3D registration of medical images such as CT, MRI, or ultrasound. The framework as well as the application can be easily extended by adding new transforms, metrics and optimizers. Additionally, the framework provides the possibility to use image masks to restrict the evaluation of metric values by the optimizer on certain areas of the images. Related publication: Stein D, Fritzsche KH, Nolden M, Meinzer HP, Wolf I. The extensible open-source rigid and affine image registration module of the Medical Imaging Interaction Toolkit (MITK). Comput Methods Programs Biomed, 2010 Oct.
Navigation systems are promising tools for improving efficacy and safety in surgical endoscopy and other minimally invasive techniques. The aim of this study is to investigate electromagnetic tracking (EMT) for navigated renal access in a porcine model. For our proof-of-principle study we modified a recently established porcine ex vivo model. Via a ureteral catheter which was placed into the desired puncture site, a small sensor was introduced and located by electro magnetic tracking (EMT). Then, a tracked needle was guided into the collecting system in a ‘‘rendezvous’’ approach. A total of 90 renal tracts were obtained in six kidneys using EMT, with a maximum of three punctures allowed per intervention. For each puncture, number of attempts to success, final distance to probe, puncture time, and localization were assessed. We compared absolute and relative frequencies using the chi-square test and applied the Mann–Whitney U-test for continuous variables. No major problems were encountered performing the experiment. Access to the collecting system was successfully obtained after a single puncture in 91% (82/90) and within a second attempt in the remaining 9% (8/90). Thus, a 100% success rate was reached after a maximum of two punctures. With respect to other established techniques, the use of EMT seems to decrease the number of attempts and procedural time remarkably. This might contribute to greater safety and efficacy when applied clinically. Related publication: Huber J, Wegner I, Meinzer HP, Hallscheidt P, Hadaschik B, Pahernik S, Hohenfellner M. Navigated renal access using electromagnetic tracking: an initial experience. In Surgical Endoscopy, 2010 Sept. This page was last modified on 24 August 2018, at 16:03.